ENERGY is the common denomination for this update of the background, cause, data and solution of the global warming and climate change problem. This update has emerged from further work and studies after the 2012 update was presented. To arrive at a comprehensive, sustainable, economically viable and competitive solution the notion of SEEMS (Super Efficient Energy Management System) has been created and utilized. The seriousness of the global warming and energy build-up in Earth´s land areas and its oceans is illustrated in the following Figure 1 (published by NASA/GISS) which shows the temperature variations during the years 1880 - 2016 and how the global land-ocean temperature has accelerated during the last decades and particularly since about the year 1980 (it also shows the much lower rate around the “depression year” 2008 in the “Lowess Smoothing” line). 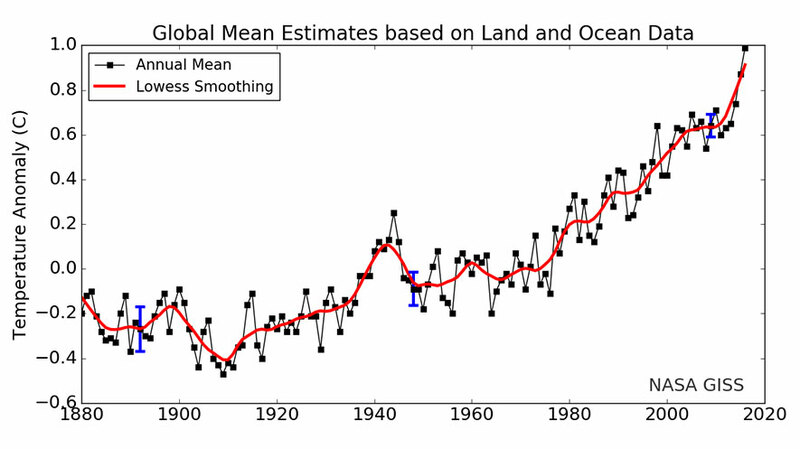 The increase of the GLOBAL TEMPERATURE is a useful indicator/measure of the global warming. It is going on in the atmosphere, on the land and in the oceans. In the oceans the total rate has been abt. 0.02 – 0.03 degrees Celsius per year in average and results e.g. in the melting of the arctic ice caps, the global average sea level rising at more than 3 millimeters per year and in increasing severe weather catastrophes.